Foodie confession time- I do not own a food processor. I mean, I have tried to own one... twice now. The first one I ever had in my kitchen didn't make it past a week before I had boxed it up and returned it to the store. Food processors & I are just not good company. I always have issues with the lids not locking correctly, or changing out the blades, or snapping in the container the right away. I would literally spend like 15 minutes just trying to get the darn thing lidded & snapped in right just so it would turn on! I did give it a shot once more. That food processor ended up in a yard sale a few months later. And I am still contemplating the possibility that I actually need one of these handy contraptions. I have come across about million recipes that the ease of a food processor would have been perfect for! One of the recipes that my husband just loves for me to make that I find myself often wishing I owned a food processor for is carrot cake. Have you tried grating carrots by hand? Or tried to break them down with a smoothie blender? That is why I just absolutely love boxed carrot cake mix! No peeling or grating carrots. Although for special recipes, like my Carrot Cake Swirled Cheesecake, I will go out & make it 100% from scratch. 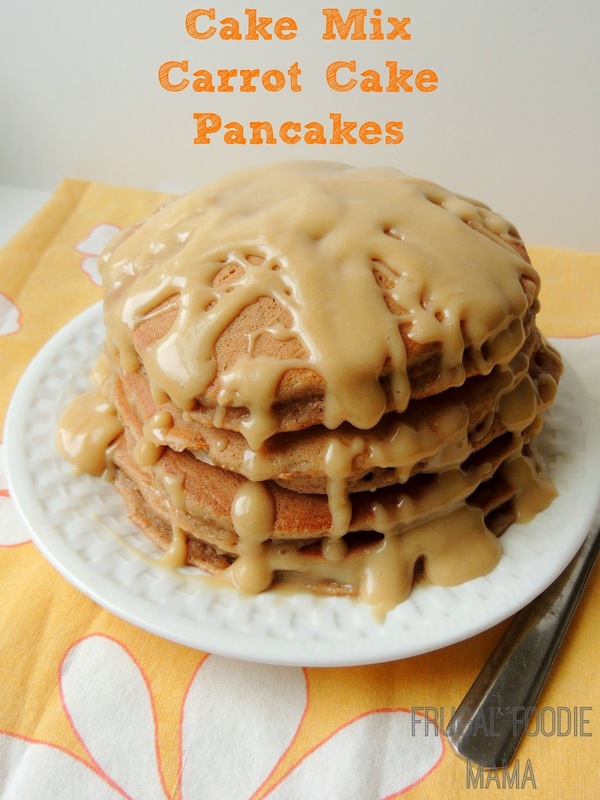 My husband pretty much loves carrot cake in any form, so I thought why not pancakes? But I couldn't just leave it at moist, fluffy carrot cake pancakes brimming with shredded coconut and pecans. I had to go and create a Biscoff Cream Cheese Glaze to drizzle over top of them. In a large bowl, whisk together the carrot cake mix & the flour. Add in the eggs, milk, & coconut oil. Whisk until smooth. Fold in the chopped pecans and coconut. Pour the batter into 4-5 inch pours on your griddle. Flip when the batter starts to bubble. Cook until golden brown. 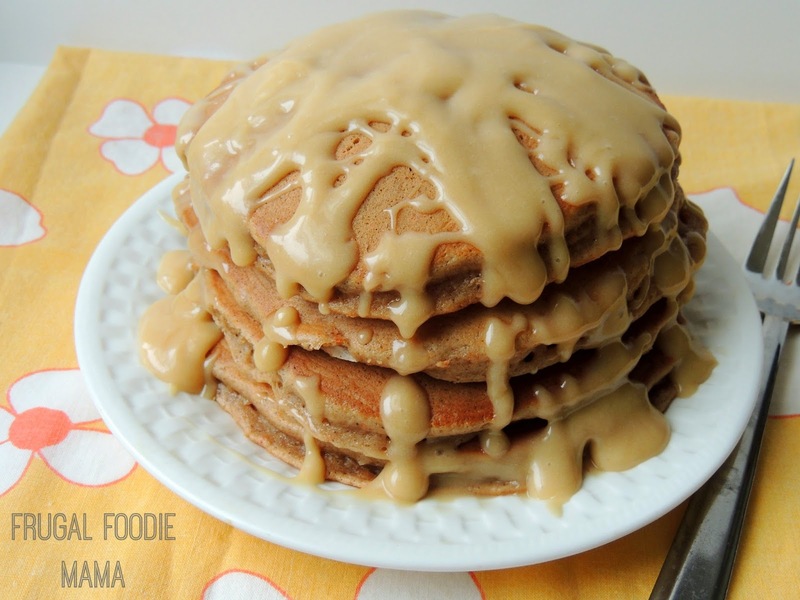 While the pancakes are cooking, prepare the Biscoff cream cheese glaze. In a medium mixing bowl, cream together the cookie butter & cream cheese. Add in the powdered sugar one cup at a time, beating on medium-low speed. Add the milk one tablespoon at a time until the glaze is a pourable consistency. Serve the pancakes warm in stacks of 3 with a generous drizzle (or pour!) of the Biscoff cream cheese glaze. 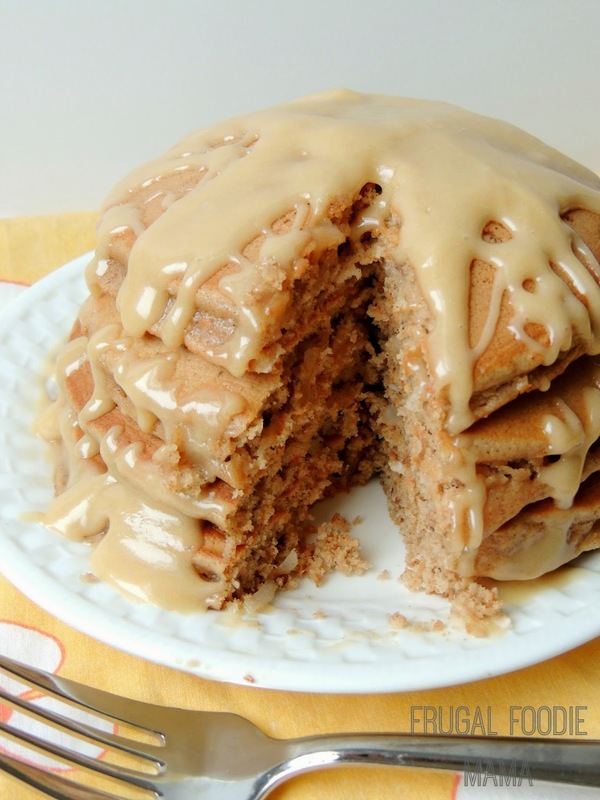 Adapted from THIS RECIPE from Tastes of Lizzy T.
These Cake Mix Carrot Cake Pancakes would be so fun and tasty for Easter morning- or any morning really! :) And the Biscoff Cream Cheese Glaze really does take this easy pancake recipe to a whole other yummy level of deliciousness. My husband and son oohed and awed over these. In fact, my son went back for another helping which is rare for him when it comes to pancakes. Are you food processor challenged like myself?